It looks like -moz-appearance: button; does not work for a <select> element. Also -moz-appearance: none; has no effect to remove the default dropdown arrow. So what is the correct value for -moz-appearance to remove the default dropdown arrow? December 11, 2014: Stop inventing new hacks. After 4 and a half years, -moz-appearance:none is starting to work since Firefox 35. Although moz-appearance:button is still broken, you don't need to use it anyway. Here is a very basic working example. April 28, 2014: The mentioned css hack worked for a couple of months but since the begining of April 2014 this bug is creeping back into Firefox 31.0.a1 Nightly on all platforms. This is it guys! FIXED! First, because the bug has a lot of hostile spam in it, it creates a hostile workplace for anyone who gets assigned to this. Secondly, the person who has the ability to do this (which includes rewriting ) has been allocated to another project (b2g) for the time being and wont have time until that project get nearer to completion. The page no longer exists and the bug hasn't be fixed but an acceptable workaround came from João Cunha, you guys can thank him for now! Update: this was fixed in Firefox v35. See the full gist for details. Just figured out how to do it. The trick is to use a mix of -prefix-appearance, text-indent and text-overflow. It is pure CSS and requires no extra markup. Long story short, by pushing it a tiny bit to the right, the overflow gets rid of the arrow. Pretty neat, huh? More details on this gist I just wrote. Tested on Ubuntu, Mac and Windows, all with recent Firefox versions. Try putting opacity:0; your select element will be invisible but the options will be visible when you click on it. 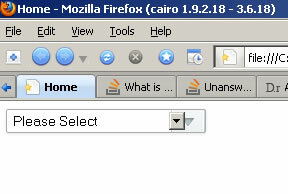 In Mac OS -moz-appearance: window; will remove the arrow accrding to the MDN docs here: https://developer.mozilla.org/en-US/docs/CSS/-moz-appearance. 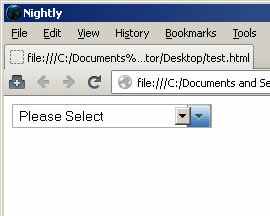 Tested on Firefox 13 on Mac OS X 10.8.2. 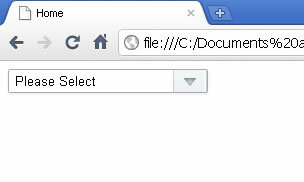 Also see: https://bugzilla.mozilla.org/show_bug.cgi?id=649849#c21. They will just hide any arrow background image you have put in to custom style your select element. So you get a bog standard browser arrow instead of a horrible combo of both browser arrow and your own custom arrow. While you can't yet get Firefox to remove the dropdown arrow (see MatTheCat's post), you can hide your "stylized" background image from showing in Firefox. This will position it out of frame, leaving you with the default select box arrow – while keeping the stylized version in Webkit. Not the answer you're looking for? Browse other questions tagged css firefox webkit gecko or ask your own question. How to Make Select Element be Transparent in Chrome? How can i remove dropdown arrow in Firefox? Is there a way to reset the border, border-radius, and background-color CSS properties?